We rate this game medium. 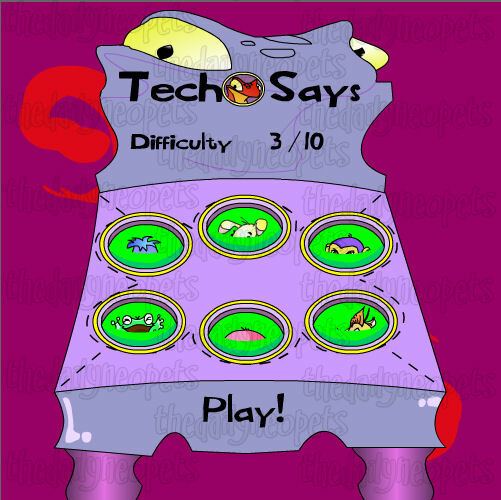 Techo Says is a classic memory game that's easy for anyone to play! It was the first game ever released on Neopets, and in honor of its place in history, the graphics are the old-school originals. The concept of the game is pretty straight-forward, but actually winning can be tricky. The first few levels may seem like a breeze, but it can get difficult really quickly. The basics are pretty simple: watch the screen when it says "Watch!" and repeat the pattern when it says "Play!". You do this by clicking on the pets with your mouse. 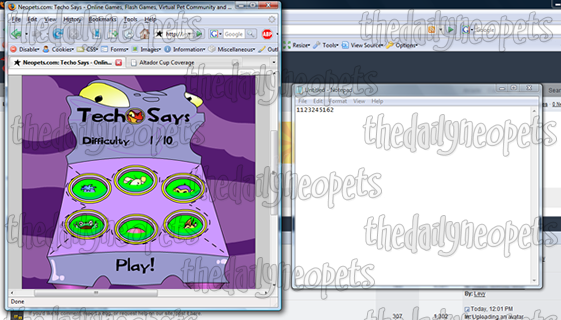 The pattern is the order in which the pets on the board pop up. Beware, you have to repeat it exactly as the game showed you or you'll lose! You don't get any extra chances. 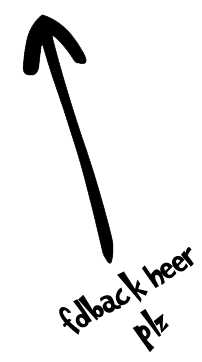 The game has 10 levels, and each level has an increasing number of rounds. The increment is five more rounds each level, so multiply the level by 5 to get the number of rounds added. If you complete the whole game, you will have completed 275 rounds! In each round, one more pet is added for you to remember. So, in round one there is one pet, in round two there are two pets, in round 36 there are 36 pets, and so on. As you go up through the levels, you will also start to see more distractions in the background, and later the foreground, too. These vary greatly, but if you have good focus, they shouldn't phase you. Say the names out loud. Repeat them over and over to yourself to help you remember. This is really only effective in the lower levels where you may even be able to get by without a strategy. Simply number off each of the pets in a way that you'll remember, then press the corresponding key for each pet. Then, you can just read off the numbers to repeat the pattern. You can also use paper and pen, or have someone else write the pattern down for you. Record the names. If you're more technologically inclined and have the resources, try turning up your speakers and setting a microphone beside them to record the names. You can then play it back and repeat the pattern. This strategy can be quicker if you're better with auditory memory. This game can be a challenge for anyone, either the novice working on the first level or the master working on the 10th. While you probably don't want to play it for several hours at a time, I like to play it for a quick bit of fun just to see how far I can go with only my memory. 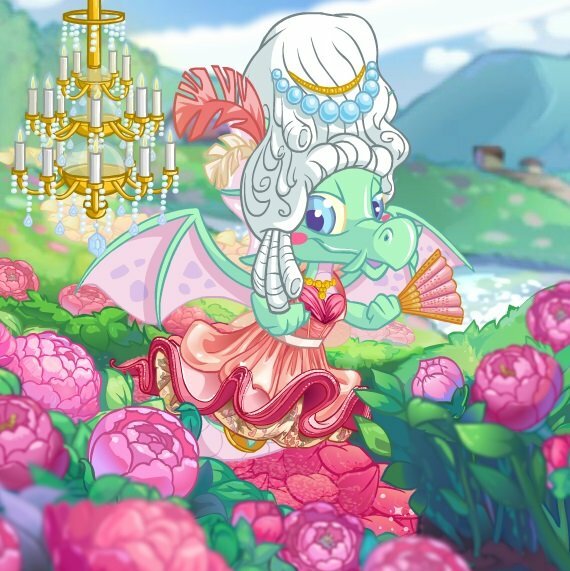 This game holds a special place in many Neopians hearts as the first game ever released, so enjoy playing a piece of history! The Snowager is awake. He'll be sleeping in 3 hours, 58 minutes.